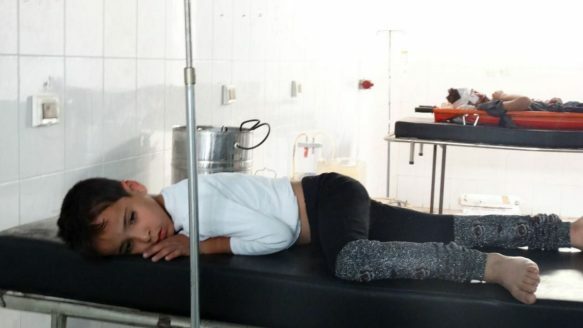 Western powers are considering the use of military force in Syria after a major chemical weapons attack that allegedly killed about 1000 civilians. France has recommended the use of airstrikes, while the U.S. is considering military options to punish Assad. This follows on the heels of Western condemnation of Egyptian military's massacre of over 600 protesters. It seems, the EU and the West cannot stop thinking about Egypt and Syria. It's always Egypt this, Syria that. Egypt here, Syria there. "Egypt and Syria" to be on agenda for top diplomats meeting... on and on it goes. The Bible talks about Egypt and Syria in the end times. Isaiah 17 predicts the complete and total destruction of the city Damascus (the capital of Syria). Isaiah 19 seems to predict a civil war in Egypt, a dictatorship (possibly by the Antichrist), and the drying up of the Nile River. Daniel 11 also states that Egypt and Syria will launch a military attack against the end times. Daniel 11 primarily discusses a historical figure called Antiochus Epiphanes. However, this prophecy transitions over to the time of the "end" in verse 35-36. Everything thereafter seems to refer to the Antichrist, and has no historical application. It says that the King of the North and King of the South will attack him. In the historical portion of Daniel 11 (verses 1-35), these terms refer to an empire in the Syrian region and Egypt. It seems this will also apply in the end times, since the same terms are used for them. Daniel 11:40 describes how Syria and Egypt attack the Antichrist in his revived Roman Empire (the EU). The Antichrist then uses this attack as a pretext to counterattack and do a sweeping invasion of many other countries as well. He ultimately subjugates Egypt, Libya and Ethiopia and/or Sudan (Cushites). This is likely the "fierce king" that will rule over Egypt, prophesied in Isaiah 19. “At the time of the end the king of the South will engage him in battle, and the king of the North will storm out against him with chariots and cavalry and a great fleet of ships. He will invade many countries and sweep through them like a flood. 41 He will also invade the Beautiful Land. Many countries will fall, but Edom, Moab and the leaders of Ammon will be delivered from his hand. 42 He will extend his power over many countries; Egypt will not escape. 43 He will gain control of the treasures of gold and silver and all the riches of Egypt, with the Libyans and Cushites[e] in submission. 44 But reports from the east and the north will alarm him, and he will set out in a great rage to destroy and annihilate many. 45 He will pitch his royal tents between the seas at[f] the beautiful holy mountain. Yet he will come to his end, and no one will help him. (Daniel 11:40-45 NIV; emphasis added). So we can see how this all can fit together. Egypt is on the brink of civil war, and is angering the West, who is beginning to place small sanctions on them. Egypt is already having a water dispute with Sudan and Ethiopia, because Ethiopia is attempting to construct a dam over the Nile. Isaiah 19 seems to speak of a civil war in Egypt that ends with their subjugation by a fierce king. It also predicts the drying up of the Nile. It is interesting that the Antichrist subdues many of the nations that are currently in the water dispute. (Daniel 11:43) Furthermore, Egypt resents Western meddling in their internal affairs. This may give them a pretext for an invasion on the EU in the future. The incumbent power in Syria's civil war (Assad), has very likely used chemical weapons on 1000 civilians. He also despises Western interference. Yesterday, an EU country (France) has recommended airstrikes on them, while the U.S. weighs options to "punish" Assad with a military strike. Hezbollah already works for Assad, which is severely stressing EU, because Hezbollah likes to fight Israel. Israel is not unusually aggressive, but they are particularly forceful in their retaliation. Isaiah 17 seems to imply that people leave the Syrian region because of the Israelites. Some suggest that the fulfillment of this prophecy will occur if Israel nukes Damascus. The EU and US are both obsessed with Egypt and Syria. They are even considering military action against them. But we prophecy watchers know that Syria and Egypt will hit first.... Egypt has the 10th largest military in the world. Syria doesn't have much of a navy, but it has a powerful ally in Russia and a very large air force.. So we can see how continuous Western interference would eventually cause them to strike first. However, if Egypt and Syria strike first... this will unite the Common Foreign and Security Policy under the Lisbon treaty. 10 EU nations have already had a mutual defense treaty, but instead decided to transfer that power to the EU instead. This is very reminiscent of Revelation 17. After an invasion, the EU will have to coordinate the military response. The Antichrist will be in control, and use this invasion as justification to invade many other countries as well. The European Union has a ten member alliance that recently consolidated into the greater European Union (called the Western European Union). Furthermore, the European Union establishes its bilateral relations with Israel and many other nations on a 7 year contract. ...And the EU has a terrible relationship with incumbent powers in Egypt and Syria.... Just as expected.